ASU's Embodied Games for Learning Lab marries digital technology with physical movement to create innovative, mixed-reality games that help middle school students learn STEM concepts. (Medical Xpress)—It might resemble the hokey pokey, but these students doing arm circles, jumping jacks and dance steps are actually learning about nutrition and physics using whole-body movements shown to help knowledge retention. Such "mixed-reality" games that merge the digital with the physical are being developed and tested by Mina Johnson-Glenberg in Arizona State University's Embodied Games for Learning Lab. "ASU is already at the forefront of games and learning," said Johnson-Glenberg, associate research professor in ASU's Learning Sciences Institute, T. Denny Sanford School of Social and Family Dynamics and Department of Psychology. "But our lab is really the only one in the country pushing hard on the principles behind this kind of embodied learning and also creating games for K-12 classrooms." "We have found that students retain knowledge better when they learn it with their bodies," she explained. "And these motion-capture gesture-rich games have the added benefit of getting students out of their seats and moving." Johnson-Glenberg noted that in 2010, more than one-third of U.S. adolescents were considered overweight or obese. She decided to create the "Alien Health Game" to address the wellness of middle school student players on two fronts. 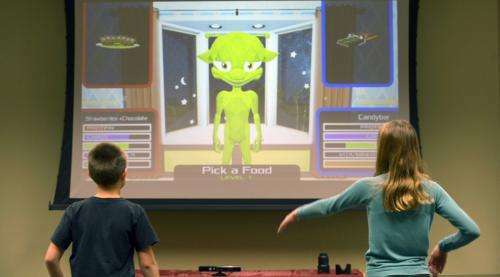 First, it is an "exergame" that requires active physical engagement in order to play, and second, the game's content promotes healthful eating choices. ASU's Obesity Solutions Initiative awarded the game a seed grant in spring 2013. To play the Alien Health Game, students must work in pairs while the rest of the class is encouraged to throw out suggestions. "There's a lot of discourse going on," Johnson-Glenberg explained. Before game play starts, the players are instructed, "You have just woken up to find an alien under your bed. It is hungry and it is your job to figure out what makes it healthy." As students make rapid food choices, they deduce through trial and error which foods make the alien healthier and which foods make it more tired due to poor nutrition. Students not only discover how the five main nutrients interact to create a balanced meal, but they also gain experience with the new U.S. Department of Agriculture MyPlate nutrition guide that recently replaced the familiar Food Pyramid. With each food choice, players are asked to perform brief cardiovascular activities – jogging, arm circles, dance moves and jumping jacks – that elevate their heart rate and help the alien metabolize food. The game gives them practice in selecting nutritional foods in real-world situations, such as going through a school cafeteria line or grabbing snacks at convenience stores. Johnson-Glenberg also has created a series of simple machine games, "Gears and Levers," with the same goal of teaching STEM to middle school students in ways that are accessible and embodied. 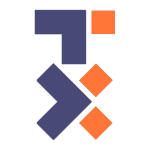 The series was funded by the Bill & Melinda Gates Foundation and Next Generation Learning Challenges. These games also get students physically involved in the learning process, in this case discovering physics principles. "I feel that physics in particular lends itself to embodied learning games," she said. "It's all about forces, that is pushes and pulls, and we can easily track those movements using motion tracking sensors. But we also like to tackle instructing abstract concepts using physical gestures, such as electric fields, which we're currently studying with a grant from the National Science Foundation." The underlying philosophy of embodied learning games asks, "How do we use gesture to help people retain what they learn?" Johnson-Glenberg insisted that a rigorous program of research is essential for assessing the new learning approach. She is lead author on three recently published research papers on the subject. "Our controlled studies are showing that whenever students use gestures to learn, they actually are remembering information longer," she said. "Often, our immediate post-tests show results with no significant differences associated with learning from embodied games. However, we do see significant differences when students return for follow-up testing a week later. At that point, we are finding that those students who learned with gestures are retaining the information longer." Johnson-Glenberg explained that the research supports gesture-based learning, perhaps because after sleep and the passage of time, students can consolidate their memories. They hypothesize that using motor memory provides an extra memory trace that helps students recall the information later – either for an exam or for use in the real world. To date, the learning scientist has developed eight embodied games for learning – enough to give teachers multiple days of interesting, innovative content to supplement their classroom lessons. She noted that getting these mixed-reality, motion-capture games out of the lab and into schools is becoming more feasible as the costs of the technology continue to fall. "We can now create sophisticated motion-capture games using the Microsoft Kinect sensor and still see learning effects comparable to a more expensive system," Johnson-Glenberg explained. As embodied learning researchers continue to develop new mixed-reality games, she added, it is important that the games not only be grounded in learning theory, but also remain enticing to students: "We need to keep these games engaging, playful and interactive in ways that typical, more passive learning technologies are not."